Stop the train!! These are CRAZY!!!! Is there a better combo than chocolate and strawberries? I think not! The very best part about these is that they are totally guilt free because they are gluten free, sugar free and dairy free! Once you look over the ingredients list, don’t get scared! 😉 These are delicious! I promise! Blend all ingredients in a blender or food processor. Make sure you take your time and blend well, being sure to scrape the sides down. If there are any chunks in this mixture, it will not be good so being sure it is mixed well is very important. 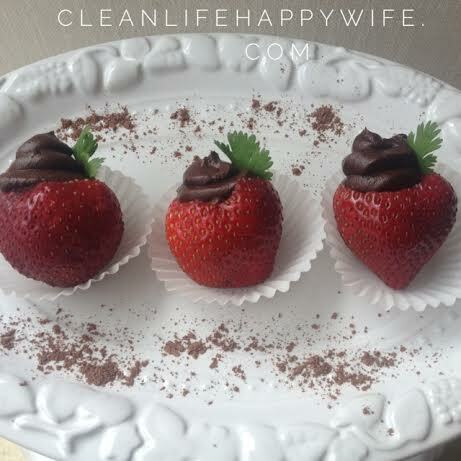 Fill a piping bag with the chocolate pudding mixture and fill in hollowed out strawberries. Oh. Yes. Nice one! 🙂 Totally making these! Mmmm!